painted dated "1803". 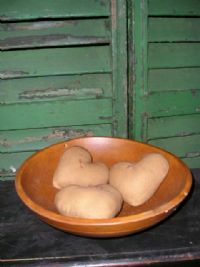 Hangs 15"
These 4 1/2" muslin hearts will look wonderful sitting in a bowl. Grungy pin in center of heart. 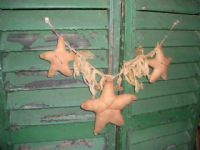 Very simple is this aged flannel garland with 3 stars. Several pieces of cheesecloth tied on to the garland. 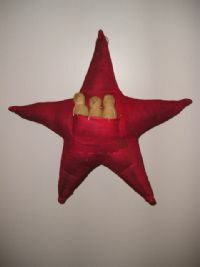 Looks great on a peg rack or on a cupboard. 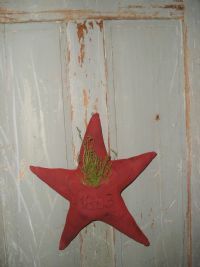 Painted mustard star with a black crow. 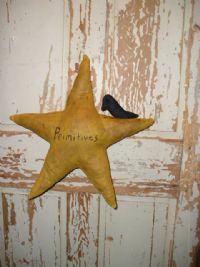 The words "primitives "painted with black paint. Then aged. Hangs tip to tip 16"